Of all the companies we have covered so far, Twitter showed us the most amazing hockey stick growth (a rare phenomena!). But things seems to have changed and the honeymoon seems to be over. Over the last few months, Twitter traffic in India (*) has stagnated. For the last three months, unique visitors to the site has actually gone down (marginally) and if you say that Twitter’s real usage happens from other applications, a recent blog entry by Twitter suggests that 78% traffic happened via the site. While that’s a worldwide data, India of course will have lot more SMS users (i.e. healthy SMS/Internet usage), the reality is that Twitter effect in India is slightly getting over (towards the sad end of hype curve?). 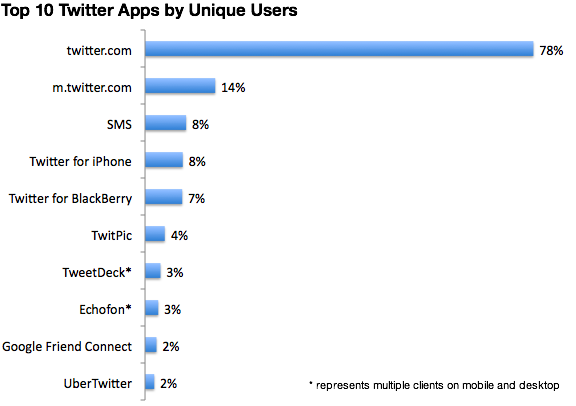 Twitter’s growth in India happened mainly because of media/big brands promoting their Twitter channel. But now that is done, the next level of battle is user engagement. And that’s where Facebook has a lot more scale and advantage than Twitter [Read this report : Sharing Happens at Facebook, Twitter is Least Engaging Share Platform]. How many ads do you see of a company promoting its Twitter channel vs Facebook page? (social advertisements, anyone?). To a marketeer, Facebook fans still brings a lot more ego boost than Twitter followers. * – Comscore doesn’t tracks cybercafe data – take this graph as a relative traffic ranking.